Artists: Mariana Castillo Deball (1975, Mexico City. Lives in Berlin/Amsterdam), Heman Chong (1977, Malaysia. Lives in Berlin/Singapore), Graham Gussin (1960, London. Lives in London), Victor Man (1974, Cluj–Napoca. Lives in Cluj–Napoca), Francesc Ruiz (in residency) (1971 Barcelona. Lives in Barcelona), Jordan Wolfson (1980, New York. Lives New York/Berlin) and Haegue Yang (1971 Seoul. Lives in Berlin/Seoul). 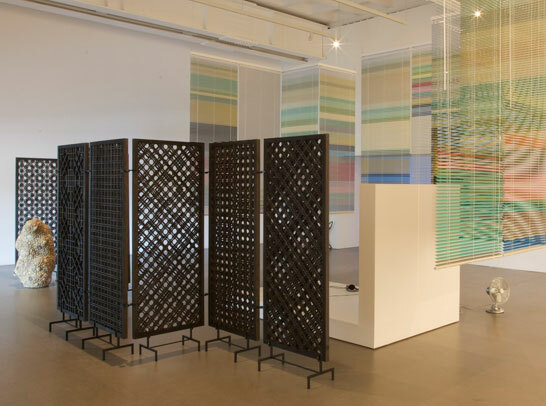 Curated with Nav Haq (Exhibitions Curator, Arnolfini). 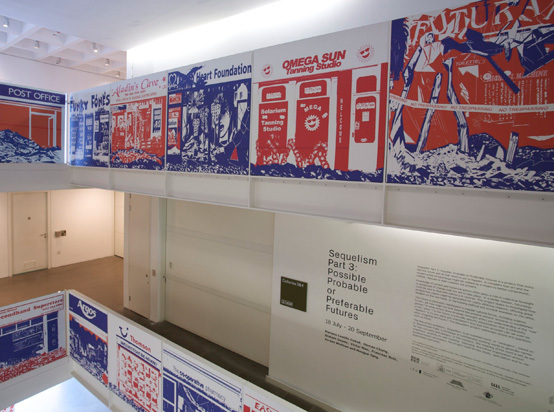 'Sequelism: Possible, Probable, or Preferable Futures' was an exhibition that looked into the future and at that which is yet to happen. It considered how art and the inexact arena of futurology might be utilised as a means to better comprehend, rethink, obscure, or even colonise the present (download Press Release and Exhibition Guide here). The future is commonly manifested in popular cultural forms, including science fiction, yet how might we look beyond the present without recourse to established genres? To what extent does strategic foresight affect our understanding of the now, the ‘then’ or the ‘when’? Is the future a culturally specific phenomenon, that is inherently Western in its gaze and orientation? And just how accurate can we be when imagining the future? Disputing illustrative organisation around a predetermined thesis, the project itself invited doubt, speculation and to-be-determined outcomes. Taking the style of a magical realist tale or childrens’ story, Mariana Castillo Deball's 'Nobody Was Tomorrow' (2007) consisted of three interconnected stories based on the fictional connections between three real ‘characters’ – ‘Nobody’ a defunct accelerating aging machine, a sprawling fig tree and the remains of a Roman bath in Čačak, Serbia. Castillo Deball makes us mindful of culture’s fortunes through a swirling fable about the sedimentation of time, encapsulated by an image of a damaged book. 'Index (Down)' (2009) was part of Heman Chong's ongoing series ‘Surfacing’, which require the action of putting up 3000 stickers on a wall within a given set of instructions. The red triangular stickers were intended to resemble the downward pointing arrows used to denote a fall in value of stock exchanges. Considering the paranoia around the scenario of economic freefall, Index (Down) used this motif to create an abstract pattern evoking a waterfall. Graham Gussin's 'Hypnotic/Dystopic/Optic' (2009) presented a ‘horizon line’ of rotating record covers for soundtracks to renowned dystopian science fiction films. The covers were set to rotate at the speed at which their images ‘vaporise’ at the limit of visual comprehension. 'In The Not Too Distant Future (Self Portrait with Sleeping Masks)' (2009) was a self-portrait of the artist inspired by a scene from the film La Jetée (1962) concerning an experiment in time travel following a nuclear war. 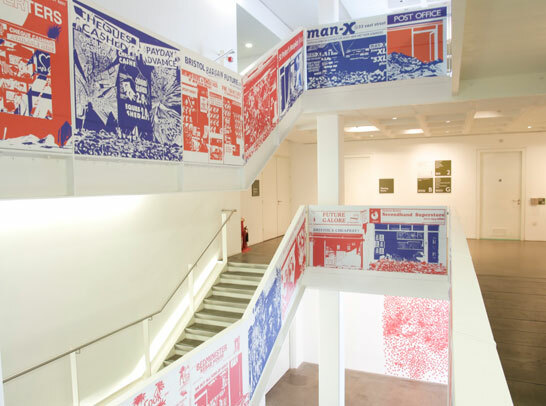 Francesc Ruiz's stair-barrier installation 'Untitled (Bristol)' (2009) took the shop windows of the high streets in the south of Bristol – East Street and North Street – as sequential units akin to comic-book vignettes. Ruiz created a narrative around a dystopian future in which destruction, revolt and anger have invaded the city after an economic downturn. Jordan Wolfson 'Untitled' (2007) centred on a 1984 Macintosh 128k, the first affordable home computer to use a mouse-driven graphical user interface. The computer was seen stranded by the side of a road in Connecticut which was built in the late 1930s following the Great Depression. The soundtrack comprised a triumphalist monologue concerning the emergence of American abstract painting in the 1950s. Wolfson was interested in obsolescence, and in these elements as generational touchstones. 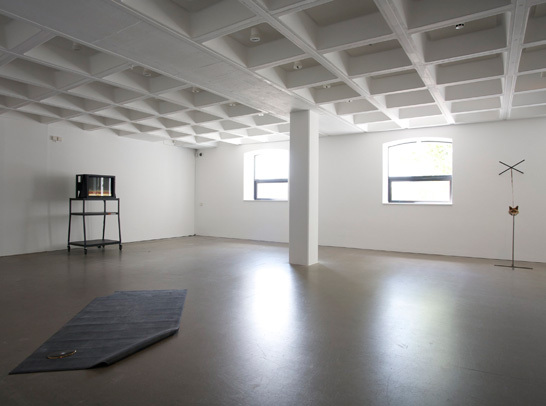 Victor Man's three pieces could be read in terms of premonition and symbolic rites which relate to the uncertainty of the future in a similar way that memory relates to the past. 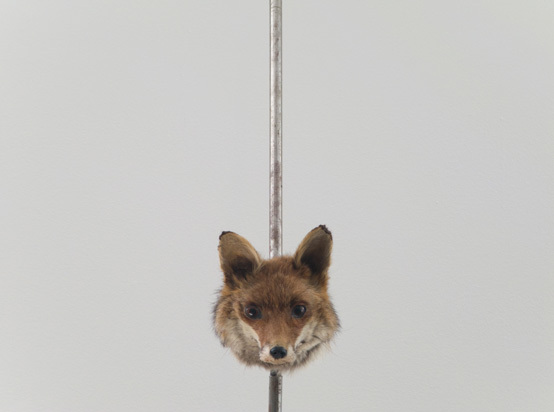 A taxidermy fox head was wedged within a metal structure as if a votive or magical offering. Vinyl text on a wall was negated by a neon ‘X’. A ceramic funerary plate bore the image of stars, whose arrangement has often been interpreted by man in terms of fate and fortune. 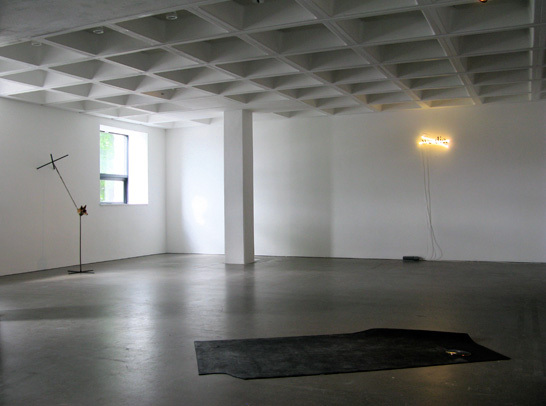 Haegue Yang's 'Holiday for Tomorrow' (2007) considered our perception of time, and the emotional anticipation of holidays, those socially-agreed days in which labour is suspended and we attempt to rest our bodies and minds. At its centre was a video essay showing Seoul during the Korean harvest holiday Chuseok over which a female voice reflected on the postponement of desire and the dysfunctional hopes triggered by enforced leisure. Neil Cummings & Marysia Lewandowska's film 'Museum Futures: Distributed' (2008) is a machinima record of the centenary interview with Moderna Museet's executive Ayan Lindquist in June 2058. It explores a possible genealogy for contemporary art practice and its institutions, by re-imagining the role of artists, galleries, markets, 'manufactories' and academies. The screening will be also incorporate a discussion led by Neil Cummings and the curators of the Sequelism exhibition, discussing the future of art institutions. A programme of artists' videos selected by the curators of Sequelism to accompany the exhibition, including works by Marjolijn Dijkman, Jordan Wolfson and Julia Meltzer & David Thorne. Introduced by Nav Haq, Exhibitions Curator, Arnolfini. Supported by the Sociedad Estatal para la Acción Cultural (SEACEX), the Direction of Cultural and Scientific Relations of the Spanish Ministry of Foreign Affairs, Institut Ramon Llull, IFA and National Arts Council, Singapore and The Ratiu Family Foundation. Comisarios: ‘Secuelismo 3ª Parte: Futuros posibles, probables o preferibles’, Arnolfini, Bristol, Reino Unido, 18 julio–20 septiembre 2009. Artistas: Mariana Castillo Deball (1975, Mexico DF. Vive en Berlin/Amsterdam), Heman Chong (1977, Malasia. Vive en Berlin/Singapur), Graham Gussin (1960, Londres. Vive en Londres), Victor Man (1974, Cluj–Napoca. Vive en Cluj), Francesc Ruiz – en residencia – (1971, Barcelona. Vive en Barcelona), Jordan Wolfson (1980 Nueva York. 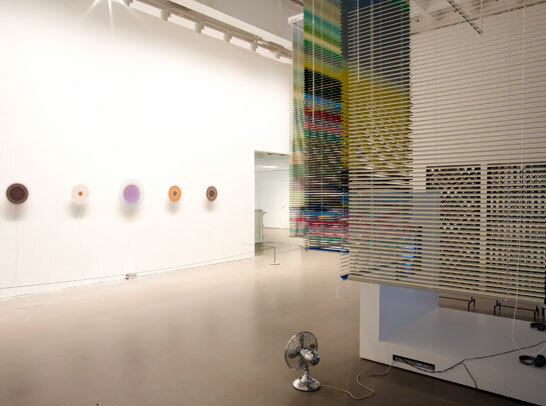 Vive en Nueva York/Berlin) y Haegue Yang (1971, Seoul. Vive en Berlin/Seoul). Comisariado con Nav Haq (Comisario, Arnolfini). 'Secuelismo...' fue una polifacética exposición entorno al futuro y lo que aún está por ocurrir. Analiza lo político, lo social y las implicaciones ecológicas del campo de la futurología (o prospectiva), una ciencia o práctica interdisciplinaria orientada a reflexionar sobre posibles, probables o futuros preferibles desde el presente. (Descargar Nota de Prensa y Guía Exposición aquí). El futuro se manifiesta en formas culturales populares, incluyendo la ciencia ficción, pero ¿cómo podemos mirar más allá del presente sin tener que recurrir a géneros establecidos?, ¿en qué medida se ve la futurología afectada por nuestra comprensión del presente, el "entonces" o el "cuando"?, ¿es el futuro un fenómeno cultural específico, intrínsecamente occidental en su mirada y orientación? y, finalmente ¿cómo podemos ser precisos al imaginar el futuro?. Disputando una organización ilustrativa entorno a una tesis predeterminada, el proyecto invita a duda, la especulación y ofrecer resultados no determinados. Tomando el estilo del realismo mágico o cuento para niños, 'Nobody was Tomorrow' (2007) de Mariana Castillo Deball narra tres historias ficticias interconectadas a través de tres personajes reales - Nobody, una máquina extinta que acelera el envejecimiento, una frondosa higuera y los restos arqueológicos de un baño romano en Čačak, Serbia. Castillo Deball conciencia sobre la fortuna que corre la cultura a través de una rocambolesca fábula sobre la sedimentación de el tiempo, encapsulado en la imagen de un libro dañado. 'Index (Down)' (2009) es parte de la serie 'superficie' realizada por Heman Chong, que requiere la colocación de 3000 pegatinas en la pared siguiendo un conjunto de instrucciones. El formato de las pegatinas (triangulos rojos) parecen flechas apuntando hacia abajo, las mismas que se utilizan en las bolsas para denotar una caída en el valor. Incorporando la paranoia creciente entorno al contínuo declive de la economía mundial, 'Index (Down)' utiliza este motivo para crear un patrón abstracto que evoca una cascada. 'Hypnotic/Dystopic/Optic' (2009) de Graham Gussin presenta cinco tapas de discos correspondientes a bandas sonoras de películas de ciencia ficción. Las tapas giran sobre sí mismas y sus imágenes se 'vaporizan' hasta el límite visual de la comprensión. La otra pieza en la exposición, 'In The Not Too Distant Future (Self Portrait with Sleeping Masks)' (2009), consiste en un auto-retrato del artista inspirado en una escena de la película La Jetée (1962), que narra un experimento de viaje en el tiempo después de una guerra nuclear. La instalación 'Untitled' (Bristol) (2009) realizada especialmente para 'Secuelismo...' por Francesc Ruiz alude a los escaparates de las calles en el sur de Bristol – East Street and North Street –siguiendo una secuencia similar a las viñetas de cómics. Ruiz ha creado una narrativa distópica en torno a un futuro en el que la destrucción, la rebelión y la ira han invadido la ciudad después de una grave recesión económica. El video 'Untitled' (2007) Jordan Wolfson se centra en un Macintosh de 128k de 1984, el primer ordenador asequible con un interfaz gráfica que el usuario podía utilizar mediante un ratón. El equipo se ve abandonado en la ladera de una carretera en Connecticut, construida a fines de 1930 tras la Gran Depresión. La banda sonora incluye un monólogo triunfalista relacionado con la aparición y culminación de la pintura abstracta en América en la década de 1950. Wolfson está interesado en la obsolescencia y en relacionar tres grandes hitos generacionales. Las tres piezas de Victor Man podrían leerse en términos de premonición o de ritual simbólico haciendo referencia a la incertidumbre del futuro, de modo similar a la que la memoria nos refiere al pasado. La cabeza de un zorro disecado está encajada en una estructura metálica como si se tratase de un voto o ofrenda mágica. Un texto de vinilo en una pared ('We die') se niega a sí mismo con un neón en forma de "X". Finalmente un plato de cerámica funeraria lleva la imagen de las estrellas, elemento que ha sido a menudo interpretado por el hombre en términos de suerte y fortuna. 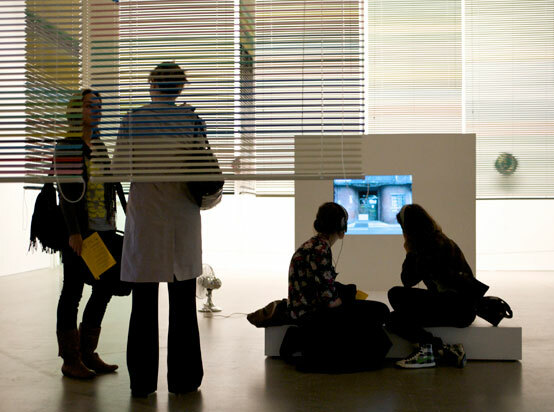 'Holiday for Tomorrow' (2007) de Haegue Yang considera nuestra percepción del tiempo, y la anticipación emocional que proyectamos hacia las vacaciones, esos días de acuerdo social en el que se suspende el trabajo e intenta relajar la mente y el cuerpo. La instalación se centra en un video que muestra imágenes de una zona mercantil de Seúl desierto durante las de vacaciones Chuseok. Una voz femenina reflexiona sobre ese contínuo aplazamiento del deseo y las disfunciones provocadas cuando el tiempo de ocio es forzado. Proyección de videos de los artistas Marjolijn Dijkman, Jordan Wolfson and Julia Meltzer & David Thorne seleccionados por los comisarios de 'Sequelism'. 'Secuelismo' contó con el generoso apoyo de la Sociedad Estatal para la Acción Cultural (SEACEX), Institut Ramon Llull, IFA, el National Arts Council, Singapur y The Ratiu Family Foundation.